The poster appeared on a screen on the side of an "ad van"
The character Gene Hunt from the BBC series Ashes to Ashes has become the focus of the latest propaganda battle between Labour and the Conservatives. 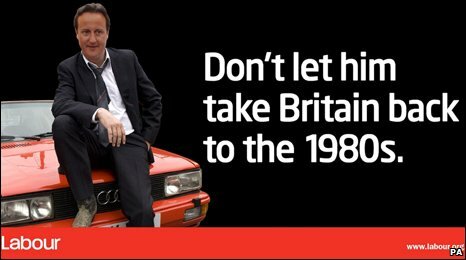 Labour's latest poster portrays the Tory leader David Cameron as the TV detective, saying: "Don't let him take Britain back to the 1980s." It attempts to link the Conservatives with social unrest and unemployment. 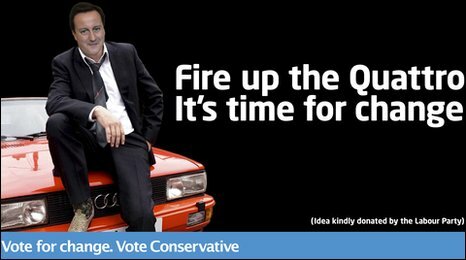 But the Tories have now adopted the image, replacing the slogan with: "Fire up the Quattro. It's time for change." Mr Cameron said he was "flattered" by Labour's comparison of him with the star of the BBC series, set in the 1980s. "I think there will be thousands of people, millions of people, in the country who wish it was the 1980s and that police were out there feeling collars and nicking people instead of filling in forms," said the Tory leader. "If Labour can't afford that, then maybe we will lend them the money." Labour's poster was launched at a school in Basildon in Essex by the Foreign Secretary David Miliband and his brother, Environment Secretary Ed Miliband. The foreign secretary said Mr Cameron would take Britain back to the "meaner and more brutal" Britain of the 1980s. "David Cameron joined the Conservative Party in the 1980s because he admired much of what Mrs Thatcher was doing," he said. "He wants to re-run the 1980s, including bringing back fox hunting." The poster's slogan, Don't let him take Britain back to the 1980s, attempts to link the Conservative leader with memories of social unrest and youth unemployment. Ed Miliband said the Conservatives landed Labour with an "unfair and divided country" in 1997. "It is easy to forget the different country we were then," he said. "People could be paid a pound an hour and that was thought to be acceptable. People couldn't rely on having modern school buildings. "The question at this election is - do we go forward or do we go back?" The new poster was not displayed on a traditional billboard but on a screen on the side of an "ad van". A Conservative spokesman said that their alternative version of the poster would be going up on the same 11 digital poster sites being used by Labour - 10 in London and one in Manchester.